With the truly amazing features that the iPhone has to offer, it's mind boggling to observe how many people still seek the lowest common denominator. Once the novelty of brilliant Apple technology wears off, bored iPhone owners turn their attention to the (next) most interesting thing they can find, themselves. 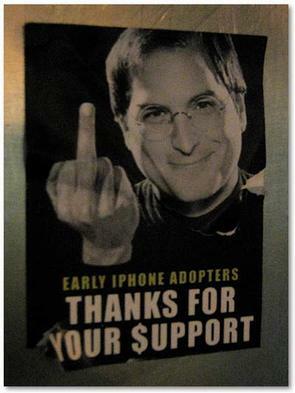 The call for dumbing down the iPhone was inevitable, with no roaming charges required. The iPhone Savior has compiled a photo gallery of the dumbest iPhone self-portraits I could find, hoping to offer some levity in the midst of the iPhone brick saga. 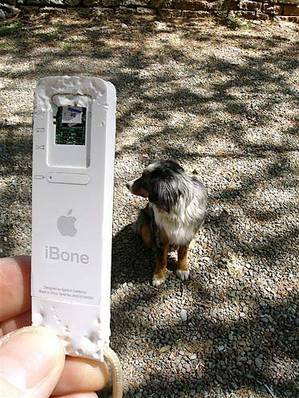 I have also included a few of the second dumbest photos, the invisible iPhone trick. 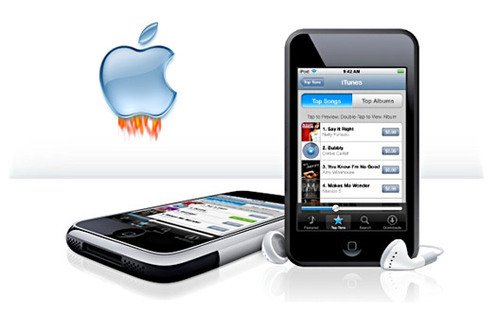 Forget about the iPhone update or getting music beamed down from the iTunes Wi-Fi Music Store. This is so much better! Enjoy. Any Genius can tell you that “An unlocked iPhone is not eligible for Genius Bar service or technical support.” Users of unlocked iPhones will find that Apple has posted a warning sign in its retail Apple Stores, denying Genius Bar assistance and technical support to all rebels flying the iunlocked flag. That's exactly what happened to Raleigh, NC resident Alan Einsteen. 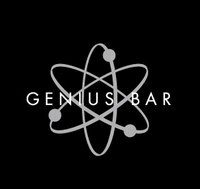 "I stood across from the Genius Bar, mad as hell and stared at them for the longest time" said Alan Einsteen, owner of an an unlocked iBrick. "I just stood there staring with my arms folded, stomping my foot and made them feel like complete jackasses." Einsteen was eventually asked to leave the store by security at the 9:30 PM closing time. 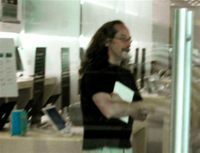 Einsteen continued his staring contest and foot stomping outside the Apple Store doors until mall security asked him to leave well after 11:00 PM. Einsteen vowed to return when the store reopened. No further incidents were reported at the Crabtree Valley Mall Apple Store. iPhone Update: A Guided Tour or Guided Missile? As promised, Apple has released the iPhone 1.1.1 firmware update with a hefty grouping of new features, with the most promising being the iTunes Wi-Fi Music Store. Brilliant! Bravo! In a thousand ways, life has just gotten so much better for planet earth. Beam me down some music Scotty! 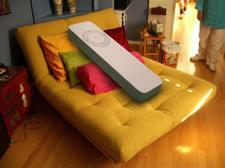 The oddest pairing of new iPhone & iPod Touch wallpapers has arrived courtesy of Photo Giddy. 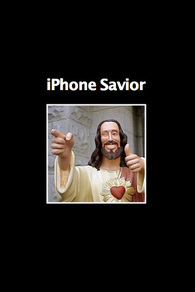 The "iPhone Brick" and "Buddy Jesus" have joined forces to bring hope to iPhone faithful everywhere. 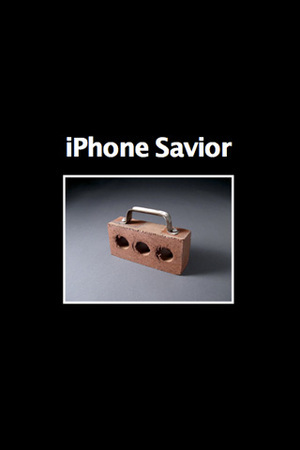 The obvious brick wallpaper themes will allow you to display an iBricked phone before or after the new firmware update. A few of these new designs will rally support for your friendly neighborhood savior too. Wear them loud and proud, then tell a friend. The Apple online store mysteriously went down on September 26th and then reopened with a few things shuffled around and a few things had silently vanished like the 4GB iPhone clearance sale.The iPod Touch is now the featured King Pin of the neighborhood. The 4GB iPhone sale is over and that bad boy is gone for good, so "get over it!" Apple is still offering the refurbished iPhone 8GB model for $349 (here) which includes the same Apple one year warranty and quality guarantee. Not a bad deal if you're all about saving $50 clams the easy way. SAMMAMISH, WA - I patiently counted down the minutes at EB Games until midnight on September 25, 2007 to capture the hoards of Halo 3 nerds unleashed, as I witnessed them pour through the front doors like spider monkeys at feeding time. 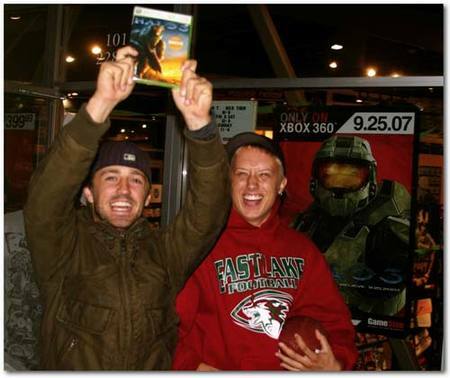 "Having no life at this moment is so worth it and totally epic", said Travis Garner, who admitted waiting in line for over ten hours for his chance to purchase Halo 3, even though many of the neo-nerds waited for only four hours, which was sufficient enough time to leave with a pre-ordered game in hand. Opening night seemed tame compared to the iPhone launch back on June 29, when rabid throngs cheered first blood. Apple has issued an official press release that is causing almost as much hysteria in the media as the launch of the iPhone itself. Apple confirmed plans Monday to release the next iPhone software update, containing many new features including the iTunes Wi-Fi Music Store later this week. 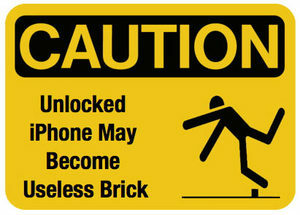 In addition, Apple hurled a "large brick of a warning" at those with unlocked iPhones. Doink! 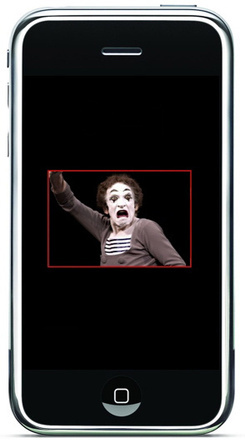 The world's greatest mime, Marcel Marceau died at 84, but his memory will live on forever in a Photo Giddy series of Marcel Marceau iPhone wallpapers. As a mime, Marceau was best known for his onstage persona Bip, a sad and chalk-faced clown who wore a stovepipe hat adorned with a red flower. Bip is now immortalized in this "trapped in an iPhone" wallpaper series. 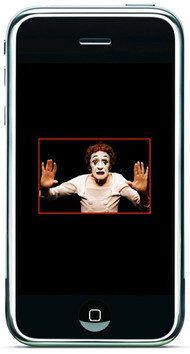 The world's greatest mime is now the world's greatest wallpaper for both iPod Touch and iPhone. An offering sure to leave Cult of iPhone fans speechless. If you're riding the Muni and stop at Powell and Market Street in San Francisco, you will run head on into a special poster message (not) from Steve Jobs (El Jobso). It's difficult to speculate on who created the poster. What's your guess? Some fan-antics just go too far. 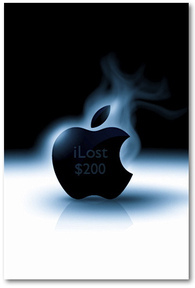 Photo Giddy has posted a new wallpaper for anyone else that is still a tad steamed over the iPhone price cut heard around the world back on September 5th. A price cut that added a significant boost to iPhone sales. But who's counting? With all the attention focused on the iPhone and iPod Touch these days, it's easy to forget about our old (chewing gum stick sized) friend, the iPod Shuffle. There was a time when that skinny little white kid from Cupertino was the talk of the town. 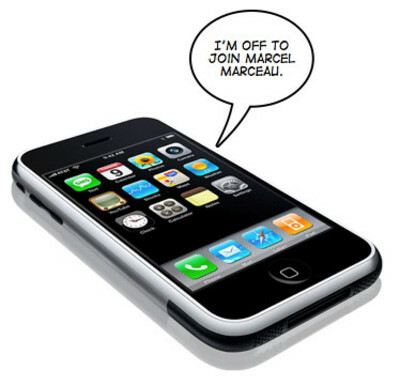 He was introduced to the world by Apple on January 11, 2005. I've compiled a revealing group of photos documenting the melancholy after-life the original iPod Shuffle has made for himself, long since being couched by Apple. For him, life still is random.